Land art, earthworks (coined by leaves), and water with introduced materials such as concrete, metal, asphalt, or mineral pigments. Sculptures are not placed in the landscape, rather, the landscape is the means of their creation. Often earth moving equipment is involved. The works frequently exist in the open, located well away from civilization, left to change and erode under natural conditions. Many of the first works, created in the deserts of Nevada, New Mexico, Utah or Arizona were ephemeral in nature and now only exist as video recordings or photographic documents. They also pioneered a category of art called site-specific sculpture, designed for a particular outdoor location. Museum paper board left on the bank of the river for 4 days. By Jacek Tylicki, S.W. of Lund, Sweden, 473 X 354 mm. Bunjil geoglyph at the You Yangs, Lara, Australia, by Andrew Rogers. The creature has a wing span of 100 metres and a 1500 tonnes of rock was used to construct it. 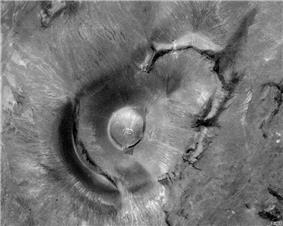 Satellite view of Roden Crater, the site of an earthwork in progress by James Turrell, outside Flagstaff, Arizona. Land art is to be understood as an artistic protest against the perceived artificiality, plastic aesthetics and ruthless commercialization of art at the end of the 1960s in America. Exponents of land art rejected the museum or gallery as the setting of artistic activity and developed monumental landscape projects which were beyond the reach of traditional transportable sculpture and the commercial art market. Land art was inspired by minimal art and Conceptual art but also by modern movements such as De Stijl, cubism, minimalism and the work of Constantin Brâncuși and Joseph Beuys. Many of the artists associated with land art had been involved with minimal art and conceptual art. Isamu Noguchi's 1941 design for Contoured Playground in New York is sometimes interpreted as an important early piece of land art even though the artist himself never called his work "land art" but simply "sculpture". His influence on contemporary land art, landscape architecture and environmental sculpture is evident in many works today. Alan Sonfist is a pioneer of an alternative approach to working with nature and culture that he began in 1965 by bringing historical nature and sustainable art back into New York City. His most inspirational work is Time Landscape an indigenous forest he planted in New York City. He also created several other Time Landscapes around the world such as Circles of Time in Florence Italy documenting the historical usage of the land, and recently at the deCordova Sculpture Park and Museum outside Boston. According to critic Barbara Rose, writing in Artforum in 1969, she had become disillusioned with the commodification and insularity of gallery bound art. In 1967, the art critic Grace Glueck writing in the New York Times declared the first earthwork was done by Douglas Leichter and Richard Saba at the Skowhegan School of Painting and Sculpture. The sudden appearance of land art in 1968 can be located as a response by a generation of artists mostly in their late twenties to the heightened political activism of the year and the emerging environmental and women's liberation movements. The movement began in October 1968 with the group exhibition "Earth Works" at the Dwan Gallery in New York. In February 1969, Willoughby Sharp curated the "Earth Art" exhibition at the Andrew Dickson White Museum of Art at Cornell University, Ithaca, New York. The artists included were Walter De Maria, Jan Dibbets, Hans Haacke, Michael Heizer, Neil Jenney, Richard Long, David Medalla, Robert Morris, Dennis Oppenheim, Robert Smithson, and Gunther Uecker. The exhibition was directed by Thomas W. Leavitt. Gordon Matta-Clark, who lived in Ithaca at the time, was invited by Sharp to help the artists in "Earth Art" with the on-site execution of their works for the exhibition. Perhaps the best known artist who worked in this genre was the American Robert Smithson whose 1968 essay "The Sedimentation of the Mind: Earth Projects" provided a critical framework for the movement as a reaction to the disengagement of Modernism from social issues as represented by the critic Clement Greenberg. 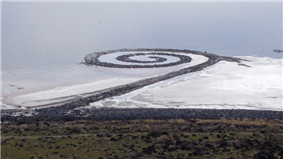 His best known piece, and probably the most famous piece of all land art, is the Spiral Jetty (1970), for which Smithson arranged rock, earth and algae so as to form a long (1500 ft) spiral-shape jetty protruding into Great Salt Lake in northern Utah, U.S.. How much of the work, if any, is visible is dependent on the fluctuating water levels. Since its creation, the work has been completely covered, and then uncovered again, by water. 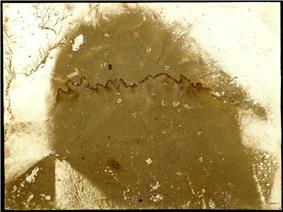 Smithson's Gravel Mirror with Cracks and Dust (1968) is an example of land art existing in a gallery space rather than in the natural environment. It consists of a pile of gravel by the side of a partially mirrored gallery wall. In its simplicity of form and concentration on the materials themselves, this and other pieces of land art have an affinity with minimalism. There is also a relationship to Arte Povera in the use of materials traditionally considered "unartistic" or "worthless". The Italian Germano Celant, founder of Arte Povera, was one of the first curator to promote Land Art. 'Land Artists' have tended to be American, with other prominent artists in this field including, Carl Andre, Alice Aycock, Walter De Maria, Hans Haacke, Michael Heizer, Nancy Holt, Dennis Oppenheim, Andrew Rogers, Charles Ross, Robert Smithson, Alan Sonfist, and James Turrell. Turrell began work in 1972 on possibly the largest piece of land art thus far, reshaping the earth surrounding the extinct Roden Crater volcano in Arizona. Perhaps the most prominent non-American land artists are the British Chris Drury, Andy Goldsworthy, Peter Hutchinson, Richard Long and the Australian Andrew Rogers. Some projects by the artists Christo and Jeanne-Claude (who are famous for wrapping monuments, buildings and landscapes in fabric) have also been considered land art by some, though the artists themselves consider this incorrect. Joseph Beuys' concept of 'social sculpture' influenced 'Land art' and his '7000 Eichen' project of 1982 to plant 7000 Oak trees has many similarities to 'Land art' processes. Rogers' “Rhythms of Life” project is the largest contemporary land-art undertaking in the world, forming a chain of stone sculptures, or geoglyphs, around the globe – 12 sites – in disparate exotic locations (from below sea level and up to altitudes of 4,300 m/14,107 ft). Up to three geoglyphs (ranging in size up to 40,000 sq m/430,560 sq ft) are located in each site. 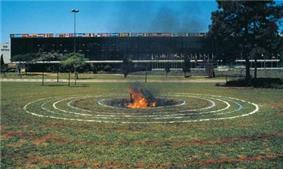 Eduardo Sanguinetti, the latinoamerican philosopher and land-artist, presented in 1979 his "Sculptures in Earth". They were placed in natural spaces, they became functional as plants and animals made their homes in that particular ´topos´instalated en La Pampa desert. Later they acquired the noise of codes capable of classifying smells and colurs, and will complete the original idea of our artist, who was at that time absorbed by the countryside and its specular radiation...in his Land-Art Performance "Solum" (1987), in the zoomorphy of that horse that greatly seduce the audience of the Centro Cultural Recoleta (ex Centro Cultural Ciudad de Buenos Aires). "Amarillo Total" the name of the horse, not only stopped the ecologic blow but also paraded the models who had been completely painted by our artist, their naked painted bodies put another body to painting, with artesan colours prepared with earth and plants pigments. In Sanguinetti's Essay "Alter Ego" (1986), he said: "Spontaneus Activity in Nature...In nature, there is a type of spontaneous activity. This concept does not exist in cultured man, and if it does remain in children, it is like a faint reminiscence of the primitive mind...Consequently I think that the survival of an awareness of the supernatural in nature, should, in all works of Land-Art, be the thing which ´animates Everything´". Land artists in America relied mostly on wealthy patrons and private foundations to fund their often costly projects. With the sudden economic down turn of the mid-1970s funds from these sources largely stopped. With the death of Robert Smithson in a plane crash in 1973 the movement lost one of its most important figureheads and faded out. Charles Ross continues to work on the Star Axis project, which he began in 1971. 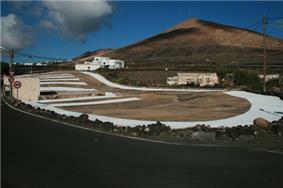 Michael Heizer continues his work on City, and James Turrell continues to work on the Roden Crater project. In most respects 'Land Art' has become part of mainstream public art and in many cases the term "Land Art" is misused to label any kind of art in nature even though conceptually not related to the avant-garde works by the pioneers of Land Art. Milton Becerra Meteorite Ibirapuera Park, XVIII Biennial of São Paulo, Brazil (1985). YATOO – a Korean Nature Artists’ Association which was founded in 1981, started working with Nature equipped with nothing but empty hands and wide open minds and seeking direct inspirations from Nature. YATOO International Project (YATOO-i), is a newly organized project and is based on the idea that the Nature we live in is seamlessly connected regardless of the human-designated borderlines. ^ "Leftmatrix". leftmatrix.com. Retrieved February 8, 2011. ^ "Observatoire du Land Art". obsart.blogspot.fr. Retrieved June 2, 2012. ^ "Monumental Land Art of the United States". daringdesigns.com. Retrieved August 27, 2010. ^ Christo and Jeanne-Claude. "Common Errors". Christojeanneclaude.net. Retrieved 2008-11-07. ^ Alter ego - Eduardo Sanguinetti - Google Libros. Books.google.com.ar. 2011-11-29. Retrieved 2013-03-23. ^ "Yatooi". Jeon, Won-gil. Retrieved 23 June 2014. Monumental Land Art of the United States.